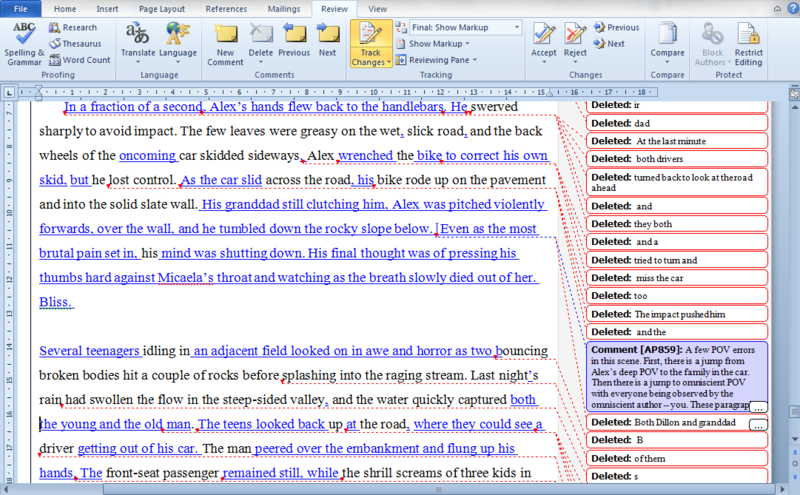 Before you hire my editorial services, you may wish to see what my editing looks like. Of course, I’m happy to provide you with a sample edit of your own work at minimal cost. But to satisfy any curiosity you may have now, below I’ve provided samples of what a light copy/stylistic edit and a substantive edit look like. 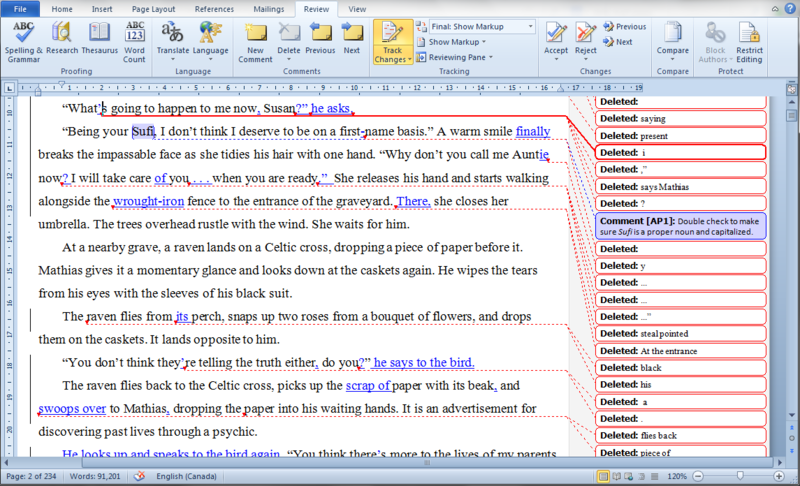 * Screen shots show how the editing appears using MS Word’s track changes feature on screen. 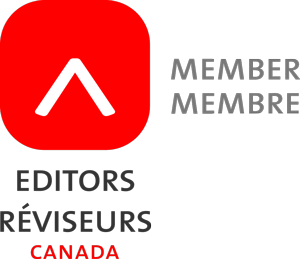 In this first sample of light copy and stylistic editing, you won’t notice much difference at first glance, but if you look closely, you can see that the corrections are fairly minor—just punctuation, spelling, and changing a few words here and there to smooth and polish the writing. The priest says ‘Amen’ and makes the sign of the cross. The caskets are lowered into the ground and several people of First Nation’s ancestry drop flowers on the caskets while saying something in their native language. They pass by Mathias giving their condolences. Soon, only Mathias and the Asian woman are present in the graveyard.“What is going to happen to me now Susan,” says Mathias?“Being your Sufi, I don’t think I deserve to be on a first name basis.” A warm smile breaks the impassable face as she tidies his hair with one hand. “Why don’t you call me Aunty now…I will take care you…when you are ready…” She releases his hand and starts walking alongside the steal pointed fence to the entrance of the graveyard. At the entrance she closes her umbrella. The trees overhead rustle with the wind. She waits for him.At a nearby grave, a raven lands on a Celtic cross, dropping a piece of paper before it. Mathias gives it a momentary glance and looks down at the caskets again. He wipes the tears from his eyes with the sleeves of his black suit. The black raven flies from his perch, snaps up two roses from a bouquet of flowers and drops them on the caskets. It lands opposite to him. The raven flies back to the Celtic cross, picks up the paper with its beak and flies back to Mathias dropping the piece of paper into his waiting hands. It is an advertisement for discovering past lives through a psychic. The priest says “amen” and makes the sign of the cross. The caskets are lowered into the ground, and several people of First Nations ancestry drop flowers on top of them while muttering something in their native language. They pass by Mathias, giving their condolences. Soon, only Mathias and the Asian woman are left in the graveyard. She reaches for his hand and protectively holds it in hers. “What’s going to happen to me now, Susan?” he asks. “Since I’m your Sufi, I don’t think I deserve to be on a first-name basis.” A warm smile finally breaks the impassable face as she tidies his hair with her other hand. “Why don’t you call me Auntie now? I will take care of you . . . when you’re ready.” She releases his hand and walks alongside the wrought-iron fence to the entrance of the graveyard. There, she closes her umbrella. The trees overhead rustle with the wind. She waits for him. At a nearby grave, a raven lands on a Celtic cross, dropping a piece of paper before it. Mathias gives it a momentary glance and looks down at the caskets again. He wipes the tears from his eyes with the sleeves of his black suit. The raven flies from its perch, snaps up two roses from a bouquet of flowers, and drops them on the caskets. It lands opposite to him. “You don’t think they’re telling the truth either, do you?” he says to the bird. The raven flies back to the Celtic cross, picks up the scrap of paper with its beak, and swoops over to Mathias, dropping the paper into his waiting hands. It is an advertisement for discovering past lives through a psychic. Next is an example of substantive (heavy) editing. It is one of the final scenes from a dramatic thriller, and I’ve rewritten portions to fix errors with punctuation, syntax, scene-setting, pacing, readability, logic, and particularly point of view (POV), a common error in fiction. Before editing, the scene was flat and confusing, with head-hopping between several points of view. Now the scene is alive with drama and tension, and its ending has the finality befitting the end of a novel (it may help you to know that Alex is a serial killer in the story). Suddenly Alex realized it was the wrong month. It might be the right day on the calendar but granddad was looking at the wrong month. He must have looking at July instead of June the silly bugger. There’d be no one there. No treats. Alex turned his head to shout to granddad when he realized he needed his hands to talk. The car coming the other way was full of a family on holiday and the kids in the back were excited about a day down on the beach. As usual they were laughing singing and fighting. Full of life. Their dad turned to say something and mother turned too. At the last minute both drivers turned back to look at the road ahead and they both swerved sharply to avoid impact. The few leaves were greasy on the wet slick road and the back wheels of the car skidded sideways and as Alex tried to turn and miss the car he too lost control. The impact pushed him across the road and the bike rode up on the pavement and into the solid slate wall. Both Alex and granddad pitched violently forwards over the wall and down onto the rocky slope below. Bouncing broken bodies hit a couple of rocks before both of them splashed into the raging stream. Last nights rains had swollen the flow in the steep-sided valley and the water quickly captured Alex and granddad. Back up on the road both car driver and front seat passenger were quiet while the kids in the back were screaming and went on screaming for a long time. The morning was damp and drizzly. As Alex motored the bike into the village, his granddad clinging to him from behind, he wished he were with Micaela instead of on this stupid outing. The town looked dead as usual, and he suddenly realized it was the wrong month. It might be the right day on the calendar, but his grandfather must have been looking at July instead of June, the silly bugger. There’d be no one there for the fair. No treats. Alex glanced over his shoulder to shout when he felt the automatic reflex of using his hands to communicate with the deaf old man. As he swivelled his head, his hands momentarily coming off the handlebars, Alex glimpsed the car coming from the other direction. It looked full of a family with kids in the back, excited as though they were about to experience a day down on the beach. They were laughing, singing, and fighting. Full of life. The father turned to say something, and the mother turned too. In a fraction of a second, Alex’s hands flew back to the handlebars. He swerved sharply to avoid a collision. The few leaves were greasy on the wet, slick road, and the back wheels of the oncoming car skidded sideways. He wrenched the bike to correct his own skid, but he lost control. As the car slid across the road, his bike rode up on the pavement and into the solid slate wall. His granddad still clutching him, Alex was pitched violently forwards and over the wall, and the two tumbled down the rocky slope below. Even as the most brutal pain set in, Alex’s mind was shutting down. His final thought was of pressing his thumbs hard against Micaela’s throat and watching as the breath slowly died out of her. Bliss. Several teenagers idling in an adjacent field looked on in awe and horror as two bouncing broken bodies hit a couple of rocks before splashing into the raging stream. Last night’s rain had swollen the flow in the steep-sided valley, and the water quickly captured both the young and the old man. The teens looked back up at the road, where they could see a driver getting out of his car. The man peered over the embankment and flung up his hands, letting out a howl. The front-seat passenger remained still, while the shrill screams of the three kids in the back seat echoed through the valley. * Authors’ samples used with permission.